If you’ve ever had to buy car insurance for teens, you know coverage can be brutally expensive. That’s why it’s especially important for parents of teen drivers to compare prices from multiple insurance companies and look for discounts. 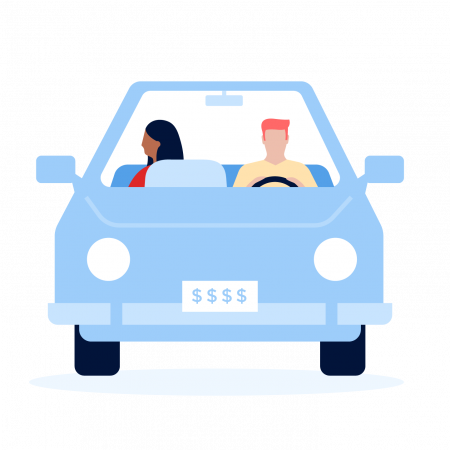 To give you a rough idea of how much it’ll cost to insure your teen driver, we looked at rates in the eight most populous states for a family with and without a teenager behind the wheel of two popular models. In our analysis, rates to add a teen driver to a policy generally ranged from $1,200 per year to $2,200 per year — though rates were much higher in some cases, depending on the insurer. If that sounds like a lot of money, a wide variety of discount are available that can help soften the financial blow of adding a teen driver to your policy. Amounts vary by state and company, but “up to” 10%, 15% or 25% off is a pretty common refrain. Add the teen to the parents’ policy rather than putting them on their own policy. NerdWallet’s research has shown it’s much less expensive to add a teen to a policy with parents. Get good grades. Families with students with a B or better average in school are frequently eligible for car insurance discounts. Take driver’s training. Young drivers who took a driver’s education course were less likely to get a traffic ticket, less likely to have an accident and less likely to be in an accident resulting in injury or death than those who didn’t, according to a 2015 University of Nebraska-Lincoln study. NerdWallet looked at insurance rates from the largest insurers for 10 ZIP codes in the eight most populous states — California, Florida, Georgia, Illinois, New York, Ohio, Pennsylvania and Texas — for a 2015 Toyota Camry and a 2015 Ford Escape. We analyzed rates for two 50-year-old married adults versus rates for two 50-year-old married adults with an 18-year-old driver licensed at age 16. In most cases we used liability coverage of $100,000 per person and $300,000 per incident; $50,000 property damage coverage, uninsured motorist bodily injury coverage of $100,000 per person and $300,000 per incident, and $1,000 in comprehensive and collision coverage. These are sample rates generated through Quadrant Information Services. Your own rates will differ.